Spot on. We have to get away from this idea that police officers etc can avoid culpability and sanction by leaving, being fired or by retiring.a scandal that cannot continue and here is an opportunity to end this practice. Pity that doesn't include Tory Mp's and editors of Newspapers who print the lies of Tory MP's as the truth. Does this now leave Sheffield Wednesday and Sheffield city council open to prosecution as well as the police ? The ESPN/BBC documentary can hopefully now be shown in this country. The jury were specifically asked about Sheffield Wednesday and they said no. Just seen this again and that particular question was about staff conduct, so Sheffield Wednesday might still be liable. They should never have picked Birchwood park as the venue. It has around 5000 people commute in & out of the park on a daily basis and the vast majority travel by car. The 2 routes into the park are pretty much gridlocked every day and when you do get there the car parking adjacent to the venue is extremely small, meaning everyone going to the inquest had to use the long stay car park over the other side of the park with a good 10 minute walk. Where else would you have suggested? ....that's within reach of all the Liverpool families I mean.....Knowsley Safari Park? At least we know now why Saint Toppy is always so bitter about Warrington - he's actually one of us and feels a bit guilty about supporting the Super Saints. That very much to one side, it's very sad that it has taken so long to get to this point, but the end has justified the means. This has been brushed aside for far too long but even the most mean-spirited folk couldn't fail to be touched by the scenes of emotion this morning. Anywhere in St Helens would have been fine as there isn't much commuting going on here and we have lots of space in our car parks! On a serious note, I'm glad that the families have received this result. For myself I hope that the investigations now starting/ongoing make sure that error and deliberate intent are separated because personally I don't want to see scapegoating take place. A lawyer on the BBC advised that an unlawful killing finding by an inquest does not mean that anything criminal or liable for civil action has actually taken place; those findings are for the Police Complaints Commission and the other independent investigation, the name of which I have forgotten, to establish. I thought the plan was to dismantle it? It first has to be established whether his actions constitute something he has to stand trial for. I can't express fully how pleased I am at this result. It's the real truth that all those who were there or were close to those that were there knew all along. It's such a shame that they have been made to wait 27 years for the truth to be wider known. The scandal is that it should never have taken this long. Had Dukinfield had an ounce of courage he would have admitted is mistake at the time. Instead he was cooking up his excuses and feeding lies to the FA and others about how the gate was opened before some of the victims had actually met their unpleasant end. A disgraceful human being and an abject coward. Of course he isn't alone, plenty went along with his lie fully in the knowledge of what happened and others were very willing to believe the police's version and put the blame on the victims. The fact that the families and campaigners have finally been vindicated after all these years is testament to their hard work, dedication and sheer bloody mindedness. They are a gobby bunch (thankfully) who would never allow the establishment to shut them up. It just goes to show the little people can take on the establishment and win. Unfortunately not all of them are still here to see the result, I'm thinking especially of Anne Williams who I'm proud to consider a friend. I'm so sorry she wasn't still here to see this. 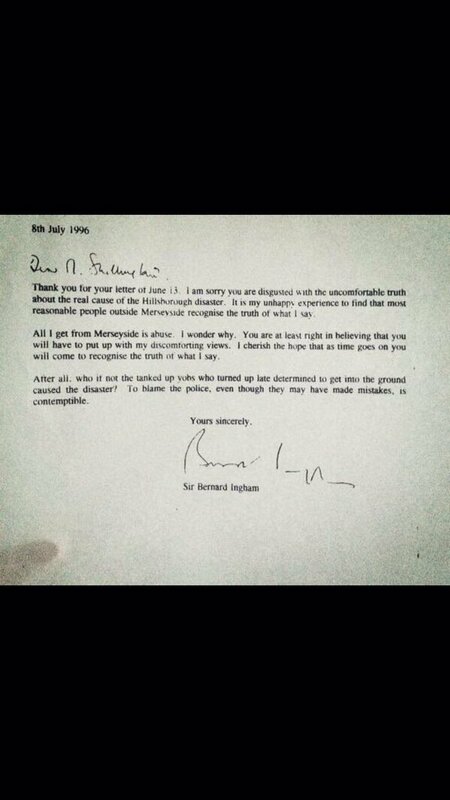 "I have no intention of apologising for my views which are sincerely held on the basis of what I heard first hand at Hillsborough. I have, however, one suggestion to make: for its own good, Liverpool – with the Heysel disaster in the background – should shut up about Hillsborough." What a disgrace to decency he and his party are. That would be the same party whose PM sanctioned the inquests that have concluded today, yes? Just posted on Twitter. Obviously, his wacky take on Hillsborough isn't the only reason he gets nothing but abuse from Merseyside, but I hope someone approaches him for a quote now the verdict is in. The Football Association are certainly culpable.Having just watched The Guardian video,with some lovely background music,they could do the same with the accompanying list of failure(s) of the FA and the Labour-run council.The head of the council being the same individual who left the Home Office,'not fit for purpose'.Yes,Blunkett. There was only going to be one conclusion. I await action on the unlawful killing of Italians.Has there not been an apology in the House,yet? Easy target and easy compensation. And we should be grateful for that. 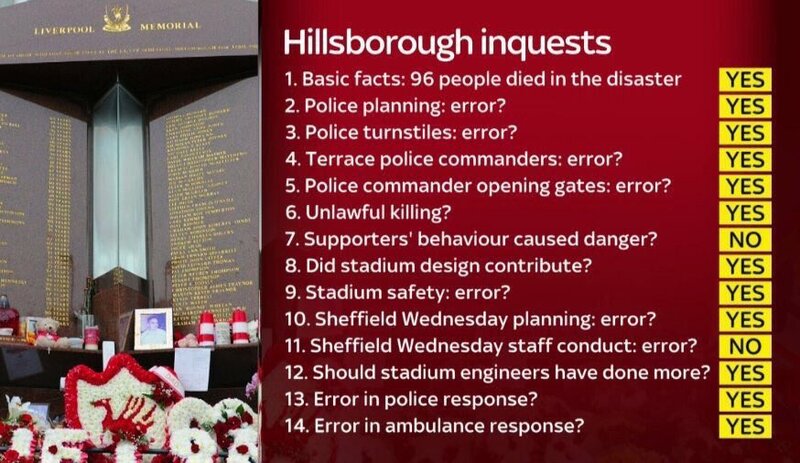 However in the light of the Hillsborough Independent Panel's report and the subsequent debate in parliament it would have been very difficult for him not to give the go ahead for the inquest.